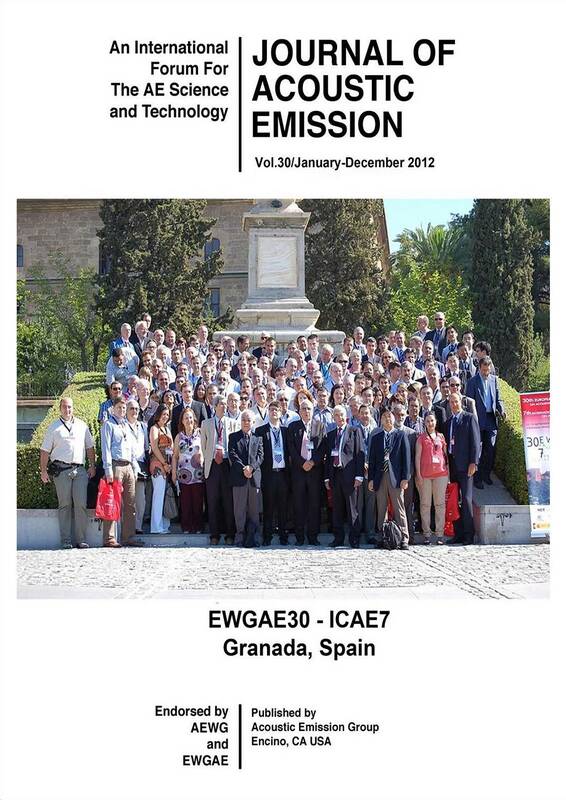 The AEWG endorses the Journal of Acoustic Emission (JAE), but the JAE is not part of the AEWG itself. For JAE Online Volumes, click here. For JAE Contents and Author Index, click here. For Notes for JAE contributorsm click here. Journal of Acoustic Emission is an international journal designed to be of broad interest and use to both researcher and practitioner of acoustic emission. It will publish original contributions of all aspects of research and significant engineering advances in the sciences and applications of acoustic emission. The journal will also publish reviews, the abstracts of papers presented at meetings, technical notes, communications and summaries of reports. Current news of interest to the acoustic emission communities, announcements of future conferences and working group meetings and new products will also be included. Cover of JAE Vol 30. A. Research Articles: Manuscripts should represent completed original work embodying the results of extensive investigation. These will be judged for scientific and technical merit. B. Applications: Articles must present significant advances in the engineering applications of acoustic emission. Material will be subject to reviews for adequate description of procedures, substantial database and objective interpretation. C. Technical Notes and Communications: These allow publications of short items of current interest, new or improved experimental techniques and procedures, discussion of published articles and relevant applications. E. AE Program and Data Files: Original program files and data files that can be read by others and analyzed will be distributed in CD-ROM. Reviews, Tutorial Articles and Special Contributions will address the subjects of general interest. Nontechnical part will cover book reviews, significant personal and technical accomplishments, current news and new products. Acoustic Emission Working Group (AEWG), European Working Group on Acoustic Emission (EWGAE), have endorsed the publication of Journal of Acoustic Emission. Journal of Acoustic Emission is published annually in CD-ROM by Acoustic Emission Group, PMB 409, 4924 Balboa Blvd, Encino, California 91316 (USA). It may also be reached at 2121H, Engr. V, University of California, Los Angeles, California 90095-1595 (USA). Tel. +1 (310) 825-5233. Fax +1 (310) 206-7353. e-mail: aegroup7@gmail.com or ono@ucla.edu. Subscription should be sent to Acoustic Emission Group. Annual rate for 2012 is US $111.00 including CD-ROM delivery, by priority mail in the U.S. and by air for Canada and elsewhere. For additional print copy, add $40-49. Overseas orders must be paid in US currencies with a check drawn on a US bank. PayPal payment accepted. Inquire for individual (with institutional order) and bookseller discounts. Available in CD only (no prints anymore): Cost on request. Payment must be in U.S. dollars drawn on a U.S. bank. PAYPAL payment is accepted. Inquire via e-mail. PMB 409, 4924 Balboa Blvd. No advertisement will be accepted, but announcements for books, training courses and future meetings on AE will be included without charge. Click here on how to contribute to Journal of AE.